The Highrock Network is a family of churches with a shared vision for locally-focused congregations. Get together with others in the Highrock Network to discuss the unique challenges and opportunities as Christians in our professions. RSVP for the April 27th event today! In May of 1999, a small group of believers gathered together to reflect and pray at a small suburban home in Needham on a street called High Rock. While their ages and backgrounds varied, their visions were unified: together, they believed God was showing them something new - that He could reach a new generation of believers and non-believers alike with a new kind of church. Words like community, seeker-sensitivity, and multi-ethnicity were discussed and named as key values for this group of believers; core convictions of their common calling. By June, these believers began meeting in the common room of a house in Cambridge, with seminarian Peter Sung preaching the first sermon. Later that summer, after establishing its first public meeting place at the YWCA in Central Square, the members decided on the name "Highrock" for their church, a reminder of the street where they first met to pray and dream. Highrock’s first Easter service had over one hundred people in attendance and a dozen accepting Christ as their Lord and Savior. Following that exciting first year, Highrock found itself at a crossroads, with too few small groups and not enough active partners in ministry to adequately sustain it. This led to the hiring of Pastor Dave Swaim in July 2000 as Highrock's first senior pastor, whose energy and experience were and continue to be gifts from God. 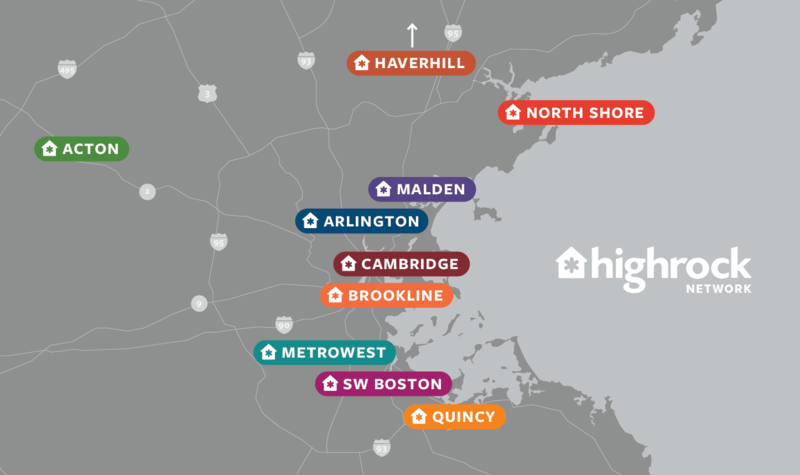 In the following years, Highrock outgrew several spaces in Cambridge and Somerville. And in 2006, with a solid core of committed members invested in the church, Highrock took a step of faith and purchased a church in Arlington, its first permanent home. Since then, Highrock has planted churches all over the greater Boston area. We invite you to join us and be a part of our story. We believe that God still has many more exciting chapters in store for Highrock, as we as a church body continue to follow His leading with obedience and boldness. We are a dynamic and diverse community, committed to transforming individually and collectively by connecting with God personally, God's people, and God's purposes. Highrock MetroWest is part of a wide community of churches. Learn about the Highrock Network, other churches in our community, and ministries we support.